With June already showing its colours, we’re excited to herald glimpses of summer time here in the lush, green South West of England. The Great British weather isn’t always ‘great’, however, so be prepared for the occasional downpour – on the bright side, ‘good for the garden!’ For those that would be glad of some added shelter when rummaging for those elusive keys on rainy days, our front door porches are ideal and provide an elegant cover for any style of exterior doorway. They can be made to order in different sizes, and for a truly substantial shelter at your doorway, take a look at our new Ironwork Porch which benefits from a deep roof. The graceful simplicity of our porch designs will add a stylish and sympathetic focal point to your property. 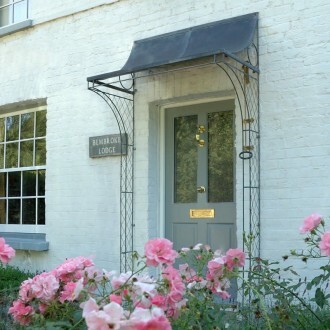 Taking inspiration from original architectural features and made using traditional techniques, our porches will turn any plain old doorway into an inviting, welcoming threshold. Made of solid steel and rust resistant, the carefully crafted metalwork weathers well and will last for many years. Georgian porch or Victorian porch? We have various heritage-inspired porch designs with decorative side panels providing sturdy support for climbing plants. Plants such as honeysuckle, climbing roses, jasmine and clematis will scramble well over the lattice to present a delightful, vibrant and aromatic entrance to your home. If you’re looking for a more authentic architectural feature, our traditional Georgian porch is inspired by original historic designs and will transform the look of your property. So, whether you wish to create a classic Victorian porch, Georgian porch, pretty cottage porch or your home is contemporary, our handmade porches will add real value to any style of property. Do get in touch with Hilary and team if you’d like to wave a wand over an unadorned doorway that’s exposed to the elements!